Georgeanne Brennan lives a charmed life with homes in both the US and Provence, France. She teaches regional cooking in France, emphasizing what is in season. 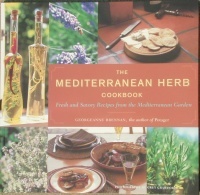 The Mediterranean Herb Cookbook celebrates all our favorite herbs: Lavender, Rosemary, Mint, Oregano, Thyme and more. Luscious recipes for every course and helpful instructions for making simple dishes elegant are indicative of Ms. Brennan's expertise. Whether you want to serve a stylish main course like Halibut Kabobs with Winter Savory and Lemon or a fun sweet like Apple Crumble with Lavender, the four recipe sections--Small Dishes, Salads and Soups, Main Courses, Breads and Sweets, and Basic Herbal Recipes--will provide ample selections. In Basic Herbal Recipes, Herb Blends like herbs de Provence, Herb Butters, Sauces, Marinades, Beverages, Oils and Vinegars are included (over 50 recipes in this section alone). Additional books you might like on cooking with herbs and spices!